The phrase that best describes "Mowgli: Legend of the Jungle" is "uncanny valley," that uneasy feeling people have when they encounter simulations of people that are real but not quite real enough. Granted, most of the characters in this movie from actor-director Andy Serkis, who helped perfect motion capture performance techniques in the "Lord of the Rings" and "Planet of the Apes" movies, are animals. But they have a lot of the same unsettling qualities. You look at their faces and see the faces of the actors who supplied their voices. Vividly. As if they were sitting across from you, having lunch. 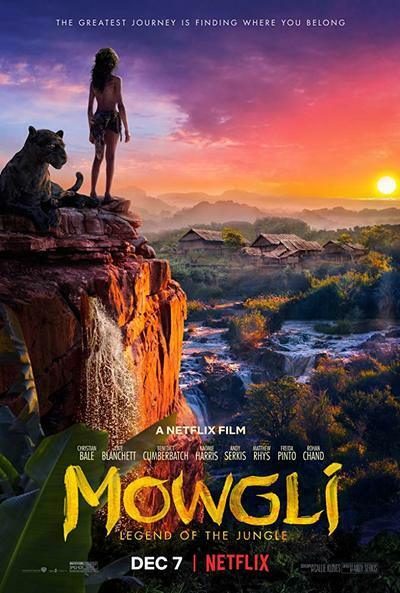 Mowgli, the little orphaned boy raised by wolves with help from a panther and a bear, is played by a human, Rohand Chan. So are all the major animal characters, including his allies, Baloo the bear (Serkis), Bagheera the black panther (Christian Bale); his mortal enemy Shere Khan (Benedict Cumberbatch), who killed and ate his family way back when; and Kaa the python (Cate Blanchett), who narrates the story and claims to be able to see the past and future equally. The animals all are modeled on the human actors who played them. You can see the resemblance in their bone structure, their expressions, and (especially) their eyes. They all have intricate, human-type lips, even the snake. In close-up shots, they could just as well be bipedal creatures from a "Star Wars" or Marvel movie that have the superficial characteristics of reptiles or mammals, but wear clothes and shoes and speak English with a distinctive regional accent (Serkis' bear is Cockney). It's the photorealistic rendering of the animals that throws the entire thing slightly out of whack. The technique seems meant to match them to their surroundings, which appear to have been shot on location or generated from footage or photographs of real jungles. But this isn't a case like Favreau's "The Jungle Book," where you can sense the spirit of Christopher Walken in King Louie the orangutan, or Bill Murray in Baloo, yet you still accept them as an ape and a bear. Serkis’ creatures feel like human-animal hybrids, right down to the way they use their hands/paws. Shere Khan even has what looks like a deformity in his right paw: it seems shrunken and twisted. The uncanny valley of intent is an issue here, too. Who is this movie intended for? It's often difficult to say. There's no way it would have gotten made if Warner Bros. hadn't banked on children wanting to see it, and parents and guardians wanting to see it with them. But it's unrelentingly brutal, at times verging on turning into a sadistic Mel Gibson action thriller with talking animals. At one point, Shere Khan scratches the flesh of Mowgli's left arm, bloodying him. Mowgli is repeatedly beaten and tormented, even locked in a cage at one point. He cries in closeup quite a bit. The lighting is as dark as the story. None of this is meant to suggest that Serkis shouldn't have made a dark version of this tale. Serkis is clearly a master of this filmmaking technology, as evidenced by the many scenes that integrate actual humans and CG animals in action that's presented in a single, long take, with no cuts (the best of these is a scene involving Kaa that takes an otherworldly turn). But the unrelenting grimness sits oddly with the slapstick comedy (particularly the early bits involving the monkeys) and some goofy supporting character voices (particularly Tom Hollander as the jackal Tabaqui, who latches onto Shere Khan as Salacious Crumb did to Jabba the Hutt). "Mowgli" seems to be going for an "'Oliver Twist,' but in the jungle" vibe but not nailing it. Serkis recovered from the disappointment of having this film shelved and went on to direct "Breathe," another ambitious yet not entirely successful movie with some marvelous ideas and sequences. I'm sure we'll see a lot more work from him as a director. But this movie gets lost in the woods early and never emerges.